Installing the Gebla system is very straightforward. Gebla offers a helpful step-by-step guide complete with photos and text on their website. We also provide our own installation guide below. Two shifters are used—one on each side of the handlebar. One shifts the SPEEDHUB 500/14 into a harder gear and the other shifts the hub into an easier gear. Shifting the SPEEDHUB 500/14 with a Rohbox will feel different than shifting a derailleur, even when the shifters themselves are the same. Shifting the SPEEDHUB 500/14 is force dependent. 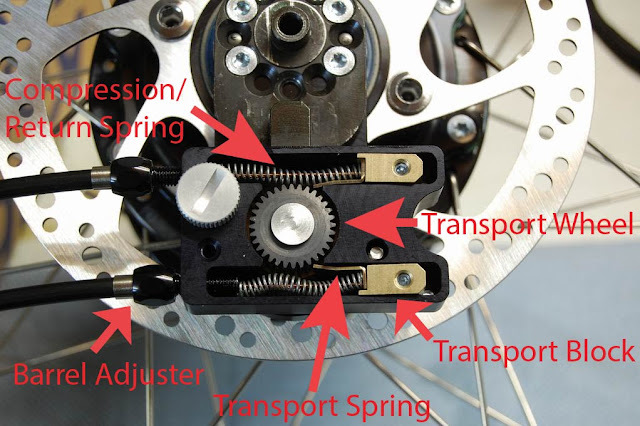 The amount of effort required to change gears—or how hard the rider must press the shift lever—depends on the amount of torque going into the hub, which is determined by how hard the pedals are being pushed. This phenomenon will feel normal to those familiar with shifting Rohloff hubs. Those new to riding a SPEEDHUB 500/14 will adapt to the system with their initial rides, as hands and wrists learn how hard the shift lever must be pushed relative to how hard they are pedaling. The amount of lever movement required to shift the SPEEDHUB 500/14 with a Rohbox is greater than the lever movement required to shift a derailleur, even if the shifters are the same. In most cases, you can change one or two gears with a single push of the lever—one gear change occurs about one third of the way through the lever travel and another one towards the end of the lever travel. However, when switching shifting directions, play in the shifting system will cause the first shift to happen further into the lever throw and possibly prevent a second shift before the lever reaches the end of its travel. The system should shift once these steps have been completed. To further fine tune the system, follow the tips and tricks below. Shifting Direction: You can choose which hand/shifter shifts into a harder/easier gear by depending on which shifter is connected to which cable port of the Rohbox. The shifter connected to the top port will change the SPEEDHUB 500/14 into a harder gear and the shifter connected to the bottom port will shift the hub into an easier gear. Lever Throw: Lever throw is influenced by the proximity of the transport spring relative to the transport wheel. This separation distance can be adjusted using the corresponding barrel adjuster on the Rohbox. Unscrewing the barrel adjuster preloads the cable and pulls the transport block towards the barrel adjuster, which moves the transport spring closer to the transport wheel. Most people prefer the shortest lever throw possible. which requires positioning transport spring as close as possible to the transport wheel without making contact. If you go too far, the transport spring will make contact with the transport wheel, causing the transport spring to interfere with shifting in the opposite direction. Minor contact will result in a grinding or ratcheting sound when shifting in the opposite direction (using the other shifter). Major contact will prevent shifting in the opposite direction all together. Adjusting the system so that the parts barely clear will provide the quickest shifting with the least amount of lever throw. Note that a) this adjustment may change over time as the cable stretches/housing compresses and b) the lever throw will always be greater than shifting a derailleur system due to the differences in how the SPEEDHUB 500/14 works compared to a derailleur. If lever throw changes over time, simply adjust the barrel adjusters so that the transport spring barely clears the transport wheel again. Cable Housing: Use derailleur/standard shifter housing, often referred to as compressionless or linear strand housing, with the Rohbox. This will ensure the crispest shifting feel and least amount of lever travel. The stock Rohloff cable housing is not recommended for use with the Rohbox. It has a spiral wind construction, which results in some compression/extension during each shift, which Rohloff finds to offer a more positive indexing feel with their twist shifter, but will result in undesirable sponginess when used with a Rohbox. Cycle Monkey offers the Gebla Rohbox as both a stand-alone unit here, or in bundles with SRAM brifters here. Bundles offer a choice of SRAM RED, Rival, or Force brifters for post- or flat-mount, hydraulic or mechanical disc brakes.